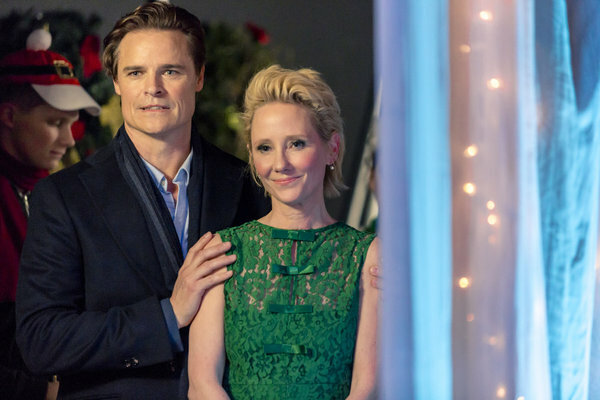 Anne Heche, who won a Daytime Emmy Award for her portrayal of twins Vicky and Marley on NBC soap opera Another World in 1991, leads the cast of Looks Like Christmas, a Hallmark Channel Original Movie premiering Sunday, December 4 at 8 p.m. ET/PT. In the holiday film, Carol (Heche) is an over-involved mother, but nothing compares to the holiday season when Carol goes over the top spearheading her kid's school’s Christmas Spectacular each year. She has earned the nickname Christmas Carol among the parents and faculty. All that changes the day Terry (Dylan Neal) moves to town with his teenage daughter. Also single, Terry is also very fond of the holiday himself—having volunteered to mount the Christmas play each year at his daughter's former school. Carol tries to politely tell the single dad his help won’t be necessary but he has no intention of stepping aside. The tug-of-war turns into something of a rumble, and it becomes clear neither of these parents are willing to work together. With the competition clearly drawn in the sand, the dueling parents set out to outdo one another in creating the most memorable Christmas spectacular ever. The pressure is on to make this the best Christmas ever as it’s anybody’s guess if “Christmas Carol” will live up to her moniker or if newly titled “Terry Christmas” will become the new holiday hero. Carol and Terry will ultimately learn the error of their ways and put aside their differences and learn they have a lot more in common as an unexpected romance begins to bloom. The cast includes Farryn Vanhumbeck, Sean Michael Kyer and Samantha Ferris.